Taste Testing Fun from Doctor Yum! Thanks to Doctor Yum for this wonderful guest post: this is an example of Taste Training in action! 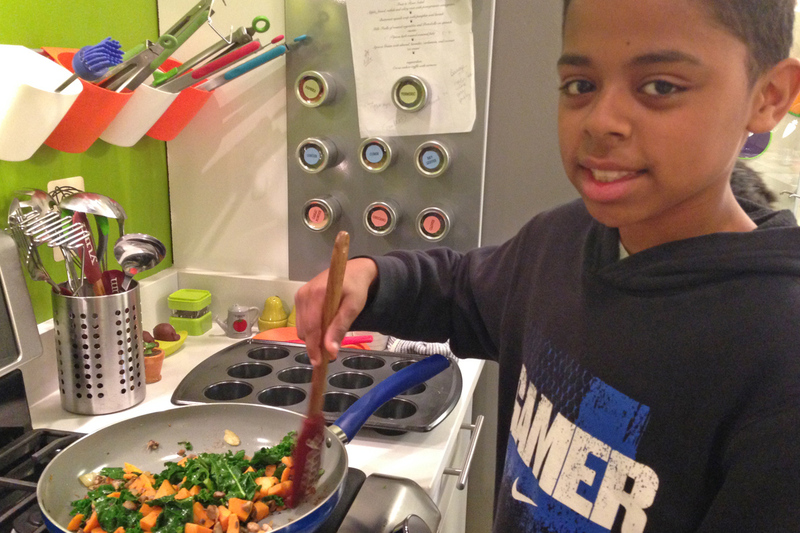 When I started my website doctoryum.com in 2011, I started asking kids in my community to try healthy family recipes after school. I called these kids “Tiny Tasters,” and most were the usual garden-variety, vegetable-hating kids. Surprisingly, with each recipe I found these kids opening up to tasting and enjoying a wider variety of healthy foods. What I didn’t realize at the time was that the environment I was creating for tasting (which I now call “Tasting Time”) was one of the most powerful tools for encouraging kids to try new foods. Following the success of the website, I founded The Doctor Yum Project, a nonprofit which aims to reduce childhood obesity by teaching families and kids of all ages to cook. I have since incorporated the “Tasting Time” concept into those cooking classes with great success, often getting some pretty reluctant eaters to open up to new foods. I now recommend that all families have a “Tasting Time” to open their kids up to trying new foods in an unpressured and joyful way. 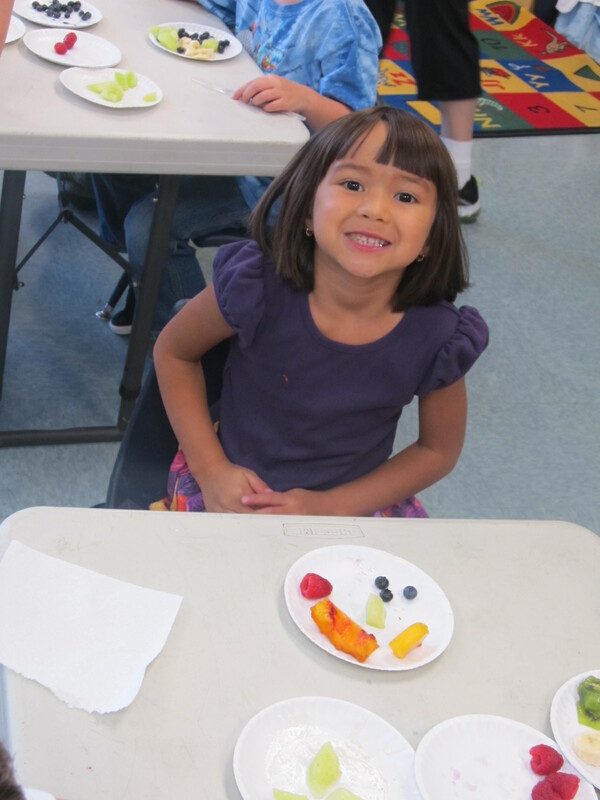 During this time, kids can explore food in a way that promotes healthy eating, much like my Tiny Tasters and cooking students do in our Instructional Kitchen. Here are some reasons that “Tasting Time” works so well and ways you can make it work for your family too! 1) “Tasting Time” is NOT part of mealtime. Typically, the after school period is the time I have classes and food tastings for our website. I find that having “Tasting Time” after school when you would serve a snack (and when kids are naturally very hungry) is a great time to try new foods, or to re-try favorite foods in new ways. When kids are asked to TASTE food outside of a meal and not EAT (or finish) food during dinner, they are more likely to take the plunge. Would you want to commit to eating a whole plate of mystery food? Probably not, but you might take one bite to see how it tastes! 2) I ask kids to taste with a smile on my face. With the same enthusiasm I would ask children to smell a scratch and sniff sticker or listen to a cool song, I ask them to, “try this neat food and tell me how it feels in your mouth!” To reduce anxiety, tell kids how the new food relates to another food they already like (“This new fruit is sweet and crunchy like that apple you liked!”). Instead of treating tasting vegetables as punishment, present it like a fun new adventure. Research shows that kids are more likely to try a new food served by a smiling parent than one who is not smiling. So put aside your own distaste for beets and SMILE when you offer them to your kids! 3) I ask kids’ for feedback about food. Get involved and ask questions. “What does this food remind you of? Does it feel crunchy in your mouth?” These are questions that show that you are interested in the child’s experience. 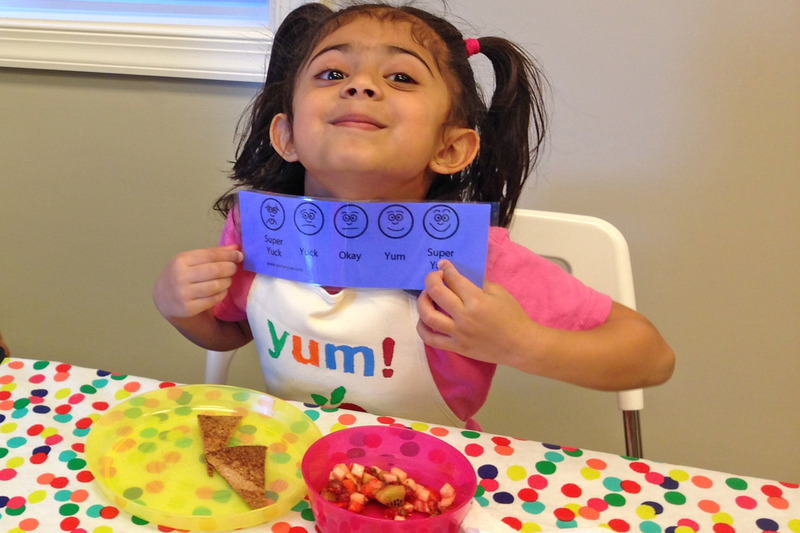 Our “Yum Score” is helpful for kids to start talking about food, too. At my practice, Yum Pediatrics, every 4 year-old leaves with an apple, a clementine, and a laminated card with a “Yum Score” so they can start Tasting Time at home. Remind kids that their taste buds need to practice. Foods that taste like “Super Yuck” can someday turn into a “Super Yum.” Help kids understand that practice is important in all areas, whether it’s riding a bike, playing sports, and even tasting food. 4) We celebrate successes. If a child is not able to taste broccoli today, give him a pat on the back for just washing it, chopping it, or stirring it into the broccoli salad. Hesitant eaters get a high five for smelling the food and a show of enthusiasm for them to taste it next time. In our classes we use “food passports” to record the food we try and encourage tasting of foods that are unfamiliar. Another way to celebrate tasting is to take pictures of their successes to share with friends. Sometimes I ask my patient’s families to post a picture of their child trying new foods at Tasting Time on my Facebook page. This can be an inspiration to us all! 5) Kids can encourage kids. 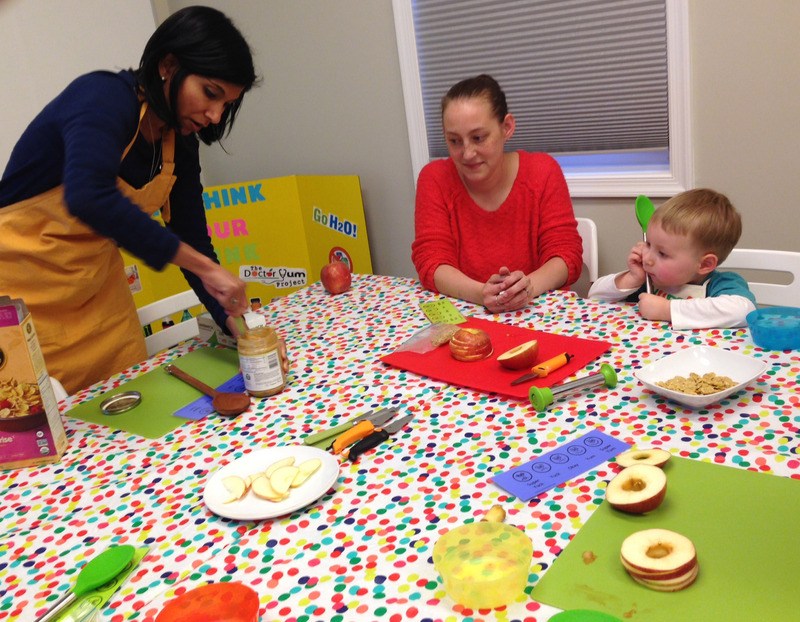 Our Tiny Tasters and cooking students often taste new foods in the company of other children. In Doctor Yum’s Preschool Adventure, a preschool nutrition curriculum written by myself and speech language pathologist, Melanie Potock, preschoolers prepare and taste food in the classroom with other preschoolers. This group experience is another reason our programs are so successful. There is a certain amount of positive peer pressure and infectious curiosity that occurs when kids try food together. At home you can do the same by watching my Tiny Taster Videos to show kids that tasting can be fun. Kids can taste with siblings or can invite friends over to try food together. One of my patients recently told me she was going to start a “Tasting Club” with her neighborhood friends! “Tasting Time” can make trying new foods less scary and more exciting. Remember to keep food fun, and your kids will be on the road to adventurous eating in no time! « Getting to Yum TV coming soon…we hope! That’s a great point Laura. My children participated in the ‘classes du goût’ in France and loved it — and I wrote about this extensively in French Kids Eat Everything. I agree: those classes are wonderful, and bring together sensory education with food education in a fun and transformative way. It is great to see these ideas spreading. I see that you’ve chosen not to publish my comment. My understanding from your attitude is that “you want to have your own cake and eat it”. Very well, but you should be honest and say to the public that these ideas are not original, they are copied from countries in Europe where children do tasting activities in kindergartens and schools. A curriculum is put in place by experts and teachers are specifically trained to teach these classes. You need to acknowledge the source of your ideas, otherwise you are plagiarizing. Hope to see you doing this. Hi there. Nothing new with these activities. Les classes du gout, are included in the national curricula of the kindergartens and schools in Europe for many years. France initiated them in 1974 and since then they became widespread in many European countries. It’s a good way to educate children about their senses and food.